A 61-yr-old Caucasian female was referred to our outpatient clinic for persistent cough, right scapular pain and purulent sputum for the past 9 months. Her past medical history was consistent with a diagnosis of pneumonia almost 20 yrs previously. She reported no allergies and was not taking any medications at home. She lived in an urban setting working as a hairdresser, and had no pets at home. She had received all the standard vaccinations based on the Italian law, including diphtheria, smallpox, tetanus, hepatitis A and typhus. She was married and had two daughters in good health. She went on vacation to Cuba 2 yrs previously, India (Rajasthan) 1 yr previously and Portugal 6 months ago. Her history of present illness was consistent with cough and mucopurulent sputum without fever for 9 months prior to visiting our clinic. She reported a scapolar right pain that had occurred 15 days prior to admission to the hospital which was not related to positioning or breathing. A negative chest radiograph had been performed 3 months prior to the visit, and at that point she was treated with oral prednisone (25 mg every 24 h for 15 days) with no evidence of clinical improvement. Finally, she underwent a chest computed tomography (CT) scan with the evidence of lung opacities with enhancement in the medium lobe and in the lingual (fig. 1a). a) Chest computed tomography scan showing lung opacities in the medium lobe and in the lingula with bronchiectasis (black arrows). A “tree-in-bud” pattern is also present in the depending areas (red arrow). b) Bronchoalveaolar lavage fluid after May–Grünwald Giemsa staining. Several rod-shaped bacteria with irregular staining and “Chinese letters” arrangement of Corynebacterium spp. are visible inside a neutrophil. Scale bar=500 μm. At the time she was referred to our outpatient clinic (Respiratory Clinics, Respiratory Department, San Gerardo Hospital, Monza, Italy) she was complaining of respiratory symptoms including cough and purulent sputum, while the physical examination was completely unremarkable. A chest examination was negative and she had did not have skin or pharyngeal lesions. A tuberculin test was performed and the result was negative. Blood examinations were obtained that showed a white blood cell count of 5.510 cell·μL−1 and haemoglobin of 13 g·dL−1, with no evidence of anti-HIV antibodies. She underwent bronchoscopy which showed mucupurulent secretions from all the lobar bronchi. 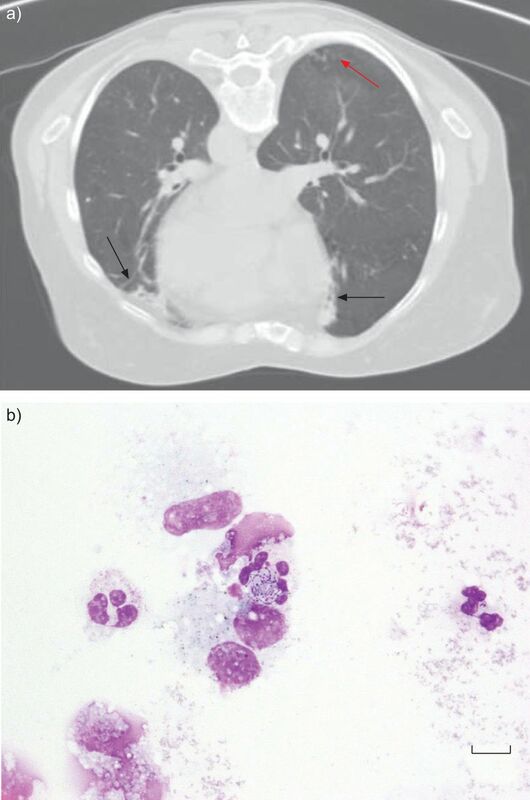 The bronchoalveolar lavage (BAL) fluid showed 1,280,000 cells in a 25-mL sample, with 29% macrophages (without emosiderinic pigment), 68% neutrophils, 1% eosinophils, 2% of lymphocytes and <1% of hystiocytes plurinucleates. Cytologic analysis for the detection of neoplastic cells was negative. Evidence of bacteria in the cytoplasma of neutrophils was noted. The result of BAL Gram stain is shown in figure 1b. Culture of the BAL yielded pure growth of Corynebacterium diphteriae. Other microbiological tests including cultures for fungi, microscopic examination for acid-fast bacilli and PCR for the detection of Mycobaterium tuberculosis were all negative. The isolate was sent to the Reference Centre for Diphtheria at the Istituto Superiore di Sanità in Rome, Italy, in order to confirm the species and the toxigenicity status of the isolate. The isolate was confirmed within 1 h as a non-toxigenic C. diphteriae by a novel combined real-time PCR assay that allows the simultaneous identification of the species and of the toxigenic status . A lack of the diphtheria toxin gene was also confirmed by classical PCR amplification. The strain was biotyped as C. diphteriae biotype belfanti using the API Coryne kit (bioMérieux, Lyon, France). Antibiotic susceptibility was performed by E-test (bioMérieux, Marcy-l'Etoile, France): the strain was susceptible to all the antibiotics tested including penicillin, ceftriaxone, ciprofloxacin, erythromycin and gentamycin. By multilocus sequence typing, the isolate was ST234, a single locus variant of ST42. The patient was treated with 1 g amoxicillin/clavulanate, three times a day for 16 days. 7 days after the initiation of the antibiotic treatment the patient recovered from all the symptoms. She was also treated with azithromycin 500 mg·day−1 and clindamycin 600 mg three times a days for 15 days. 10 days after the initiation of antibiotic therapy, the patient, her husband and her daughters underwent a pharyngeal swab to detect C. diphteriae and results were all negative. 2 months after the diagnosis, the patient underwent bronchoscopy and BAL cultures were all negative. Finally, a new chest CT scan was performed and all the lesions seen on the previous CT scan were reduced in diameter. We reported a case of chronic pneumonia sustained by a non-toxigenic C. diphteriae biotype belfanti in an Italian immunocompetent female. This is the first report of a low respiratory tract infection sustained by a non-toxigenic strain of C. diphteriae biotype belfanti. The isolate belongs to the novel ST234, a single locus variant of ST42, which has been found in the USA and Germany. ST42 and its variants are associated with non-toxigenic C. diphteriae biotype belfanti only . A resurgence of diphtheria was reported during the 1990's, especially in the newly independent states of the former Soviet Union due to a reduction of the vaccination coverage. In the rest of Europe only a few cases of diphtheria are reported each year . Conversely, the incidence of non-toxigenic C. diphtheriae strains is increasing . Non-toxigenic strains can be isolated from different types of infection, such as skin lesions, pharyngitis, bacteremia and endocarditis, as well as in patients with pneumonia, although this is a rare occurrence [5–7]. Immunisation against diphtheria toxin does not protect from the infectivity of non-toxigenic strains, supporting the hypothesis that C. diphtheriae may have additional virulence factors . Most non-toxigenic C. diphtheriae strains causing invasive diseases belong to biotypes gravis and mitis, while biotypes intermedius and belfanti are less common . Clinical manifestations associated with C. diphtheriae infections are depicted in table 1, according to toxigenic status. Our case is of some interest for several reasons: 1) the development of chronic pneumonia; 2) the presence of a non-toxigenic strain; and 3) the absence of severe systemic manifestation. Honma et al. reported a similar case of a Japanese female with amyotrophic lateral sclerosis who suffered from pneumonia sustained by a non-toxigenic C. diphteriae mitis, undergoing tracheostomy and mechanical ventilation because of a respiratory distress. In our case, symptoms developed during a long period of time and there were no life-threatening events. Different speculations could be generated by our report. Particularly, one could argue if C. diphtheriae was the pathogen responsible for those symptoms, or a super infection/colonisation. However, the antibiotic therapy directed to that pathogen led to a positive outcome. The real incidence of infection sustained by non-toxigenic strains of C. diphtheriae is unknown, but we can speculate that the real incidence is underestimated because broad-spectrum antibiotics are currently given empirically to patients.
. Identification and molecular discrimination of toxigenic and non-toxigenic diphtheria Corynebacterium strains by combined real time PCR assays. Diagn Microbiol Infect Dis 2012; 73: 111–120.
. Multilocus sequence typing identifies evidence for recombination and two distinct lineages of Corynebacterium diphtheriae. J Clin Microbiol 2010; 48: 4177–4185.
. Diphtheria in the postepidemic period, Europe, 2000–2009. Emerg Infect Dis 2012; 18: 217–225.
. The return of Corynebacterium diphtheriae: the rise of non-toxigenic strains. J Hosp Infect 1995; 30: Suppl. 306–312.
. Emergence of related non toxigenic Corynebacterium diphtheriae biotype mitis strains in Western Europe. Emerg Infect Dis 1999; 5: 477–480.
. Endocarditis caused by Corynebacterium diphtheriae: case report and review of the literature. Pediatr Infect Dis J 2000; 19: 159–163.
. Characterization and comparison of invasive Corynebacterium diphtheriae isolates from France and Poland. J Clin Microbiol 2012; 50: 173–175.
. The changing epidemiology of diphtheria in the vaccine era. J Infect Dis 2000; 181: Suppl. 1, S2–S9.
. A case of afebrile pneumonia caused by non-toxigenic Corynebacterium diphtheriae. Jpn J Infect Dis 2009; 62: 327–329.